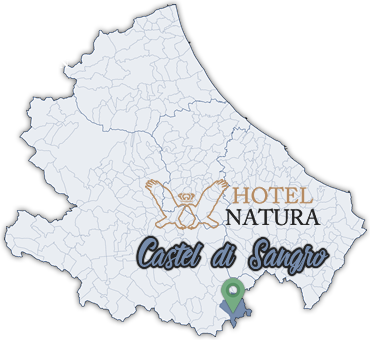 Located in a quiet area, just 1 km far from Castel di Sangro, Hotel Natura offers a large spa with indoor pool and wellness facilities. The Hotel Natura is 20 minutes drive from Abruzzo National Park and 12 km from the ski resorts of Roccaraso and Rivisondoli. You can use a ski storage room on site and enjoy special rates at a nearby ski school. Take the A14 towards Ancona, follow direction Roma, continue on the highway A25, exit Bussi/Popoli, follow direction L’Aquilaand continue on SS 17 towards Castel di Sangro. From the highway A14 follow the direction to Pescara; at North Bari take the motorway A16 towards Benevento, continue to the junction RA9 and in Benevento continue on SS 88, exit towards Campobasso, continue on SS 17 and follow signs for Castel di Sangro. To consult train timetables visit Ferrovie dello Stato.